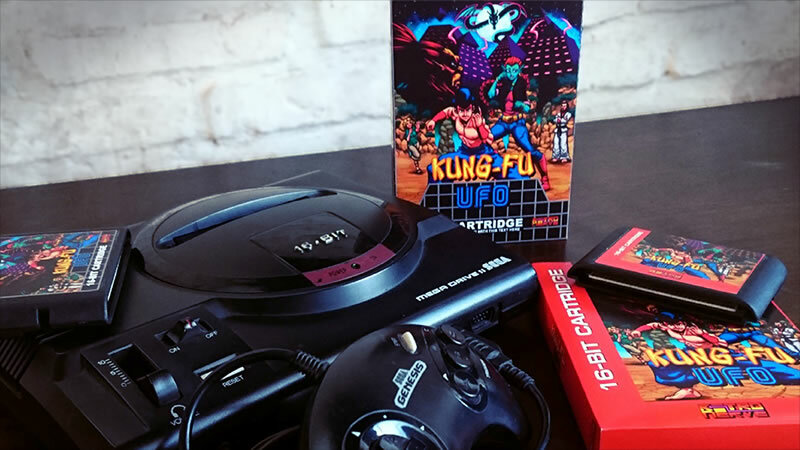 The Genesis has been enjoying a great run of new releases lately, and the newest title to compete for a place in the machine’s ever-growing library is Kung-Fu UFO. Coming from Retro Nerve, a two-man team of retro game fans hailing from Uruguay, the game is an action/beat-’em-up that sports some great visuals, a rockin’ soundtrack, and some interesting gameplay. Retro Nerve formed in 2017 and has partnered with Second Dimension (Handy Harry, Socks the Cat) for publishing a physical release that includes box and manual. Kung-Fu UFO’s plot is straight out of the old school. It’s the ’90s… You are a humble boy from a small country who never knew his father. One night, a beautiful alien being reaches out to you through your old ZX Spectrum computer to give you a mysterious message. Moments after, a strange looking Chinese bandit crashes through a window, kidnaps your mother, and leaves behind nothing but a map pinned to your front door with a knife. Reminds me a bit of Hook! Retro Nerve took inspiration from 16-bit classics like Mortal Kombat, Prince of Persia, and Street Fighter for its combat, which includes combos and special attacks. The team has also added exploration and puzzle elements to spice up the gameplay. Additionally, there are bonus levels with varied gameplay elements reminiscent of Contra and Battletoads. Reportedly, there are also bits of more obscure C64 and ZX Specturm The Way of the Exploding Fist and The Way of the Tiger in the gameplay, so you can bet that we’re interested! To fund the project, Retro Nerve is taking the same crowd-funding route as previously successful Genesis aftermarket releases like Tanglewood and Xeno Crisis. Kung-Fu Hero has an Indiegogo campaign that recently started and has picked up some solid momentum. The game has been making the expo rounds, appearing at Gamescom in Germany, and it looks like a serious addition to the list of quality titles that Genesis owners have seen pop up over the past few years. 16-bit Pixel Art: Beautiful hand crafted and animated graphics and cut scenes. 16-bit Chiptunes: A rocking soundtrack with a variety of songs and tons of sound effects. Story-Driven Gameplay: That mixes different genres like platformer, beat’ em up, fighting and more. A Main Character with Lots of Different Moves: Kicks, punches, combos, and special attacks with more to be unlocked as you make your way through the game. Vehicles to Drive and Boss Fights to Win: Because running around all the time is not that fun, you’ll also be able to drive a motorbike, a plane and others… stopping here and there to finish off some huge baddies in order to go on with the story. Varied Stages: The levels vary not only graphically but also in gameplay mechanics, with bonus stages and huge levels for you to explore and clean out enemies. Wide Variety of Enemies: Keeping the gameplay and the game’s progression diverse in every chapter from beginning to end. Multiple Difficulty Levels: So anyone can enjoy and finish the game and everyone can set the bar to the preferred challenge. Password System: Bringing back the almost forgotten-yet-thrilling experience of getting a pen and a piece of paper and writing down a code in order to be able to continue the game where you left off. There’s a demo of Kung-Fu UFO available for those who want to see it in action. The version featured is quite early (in the alpha stage), so there’s still plenty of tweaking to be done. What’s there shows some great promise (the parallax and music are especially great! ), and if Retro Nerve can deliver on the concept they’ve pitched, Genesis owners will have another solid release to add to their libraries. The game’s Indiegogo campaign is well under way, so head on over and help give this project a push if you’re interested.